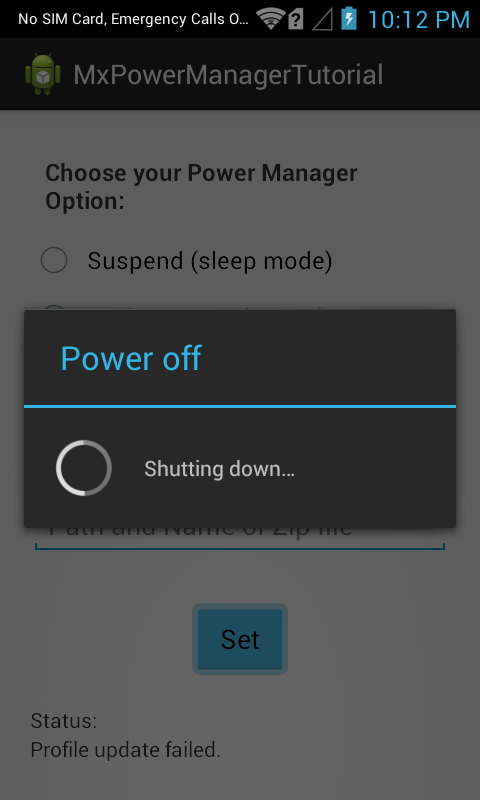 This feature allows device to enter the sleep mode in order to conserve power. Device Reboot feature restarts the Symbol device from the app itself. Note: Copy the update package to external SD Card in order to make update OS work. If you copy update package to the internal SD card of the device, the OS Update feature won't work. Enterprise Reset: Resets the device data except Mx Enterprise Packages. Factory Reset: Resets the device data. Full Device Wipe: Performs a full device wipe. 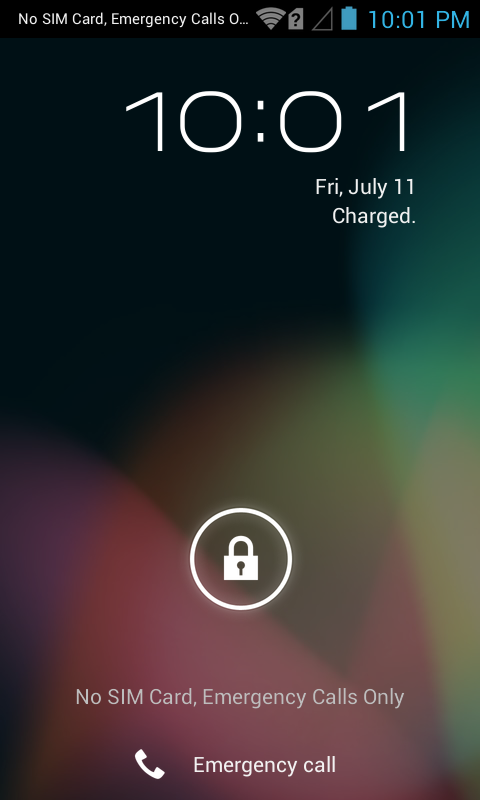 Supported on Symbol devices with KitKat version. OS Upgrade: Upgrades/Downgrades device's Operating System. In this tutorial, We would be implementing all three features of Power Manager to understand how they work. Download the respective OS update/Factory Reset/Enterprise Reset package (zip file) from here and copy that file to external SD card of the device. 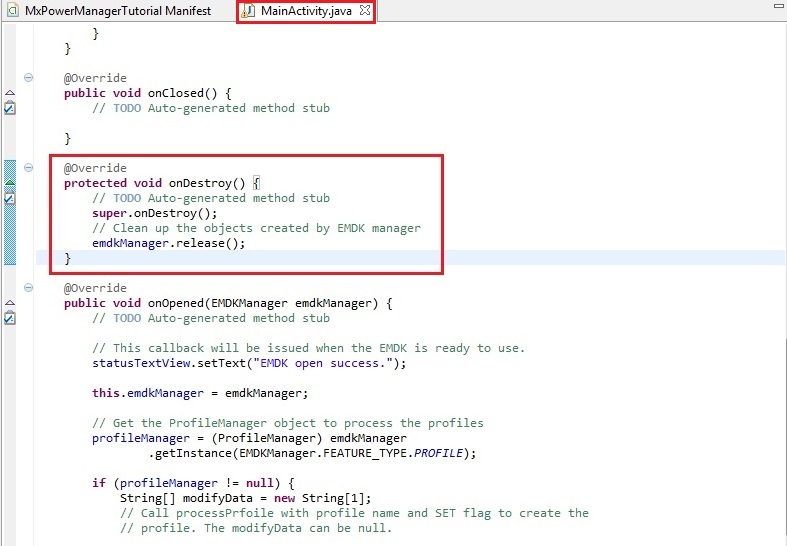 Note: Provide "MxPowerManagerTutorial" as the project name for this tutorial. 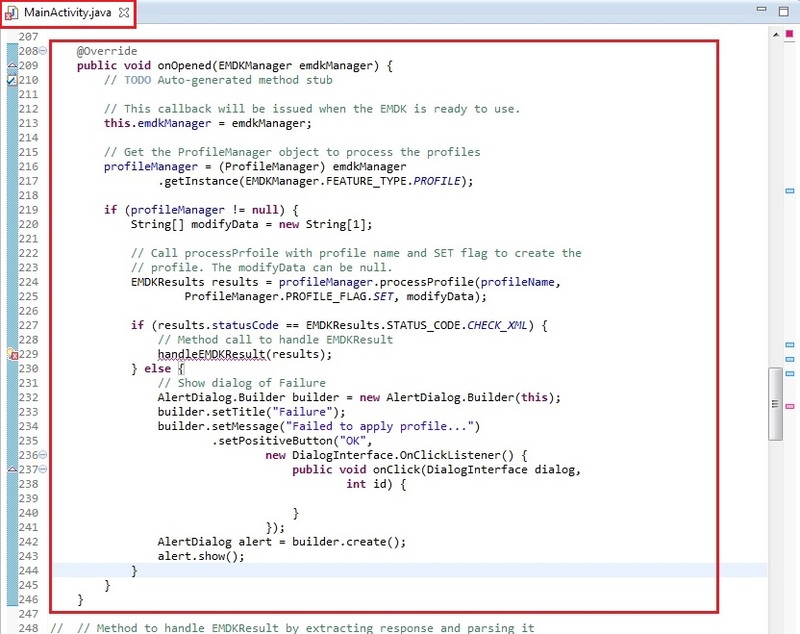 Provide "PowerManagerProfile" as the Profile Name for this tutorial. Now, you can see all these MX features on the left hand side of the Profile Editor window. Select the "Power Manager" feature from the list and click "Right Arrow". 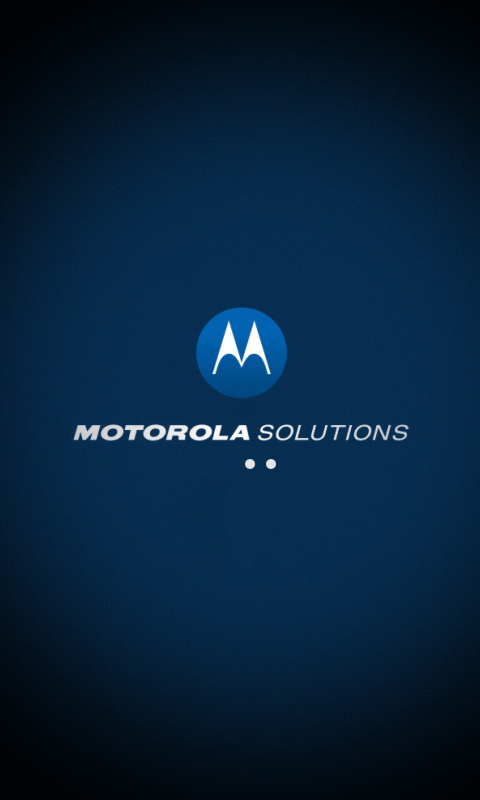 Using this feature you can perform various Power Management operations through your apps on the Symbol device. These operations include setting the device into sleep mode , rebooting the device and updating OS of the Symbol Android devices as explained earlier. 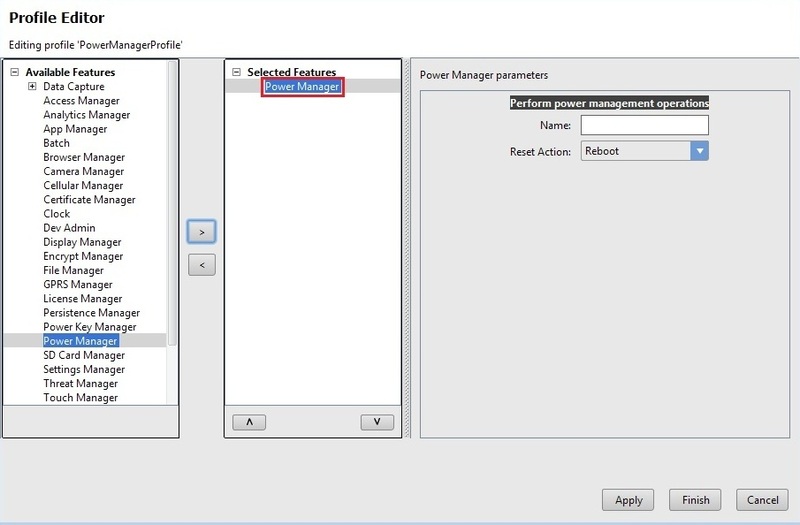 Click on the Power Manager feature. The parameter list will be populated. Now Click on the drop-down of the action field to see the supported features by Power Manager. There are different features shown in the drop down as explained earlier. As the name suggests, the feature Do Nothing does nothing. We would be configuring above mentioned three features from the application itself. Hence let us select the Reset Action in the wizard as Do Nothing. Note: You could select any option you want in the wizard and the application will implement that feature on the launch. Note: Provide some name in the Name field (Ex. MyPowerManager) in order to refer that specific feature of Profile. You can also keep Name field empty. You can inspect the "EMDKConfig.xml" to see it is reflecting the changes made to the parameters via EMDK Profile Manager GUI earlier. However, it is advised that this file not be manually updated and only be controlled via the Profile Manager. 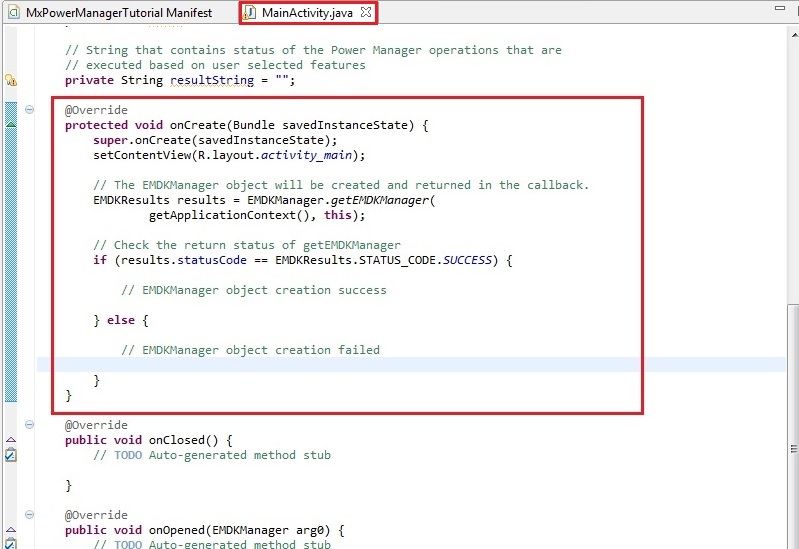 So you can see the entry of the 'Reset Action' parameter of Power Manager feature and the value assigned to it is 0. Based on user selection, these values would be assigned against these parameters of the Power Manager feature in EMDKConfig file. 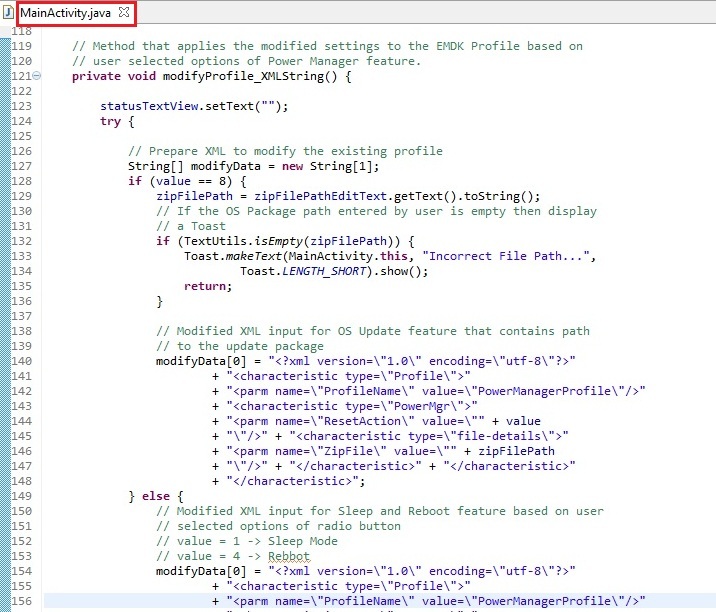 Note: These values are useful when we modify Profile from the application using EMDK API, which we will see shortly in this tutorial. 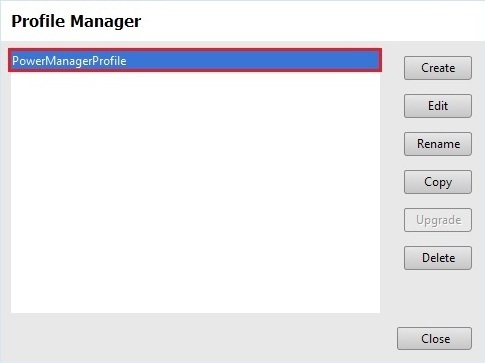 We will now create some global variables to hold the profile name as well as instance objects of EMDKManager and ProfileManager. We will also create global variables to hold the UI elements and values that are required in this application. Some of the variables are used to hold the name, type and description in case of any errors. These variables would be used throughout the code. 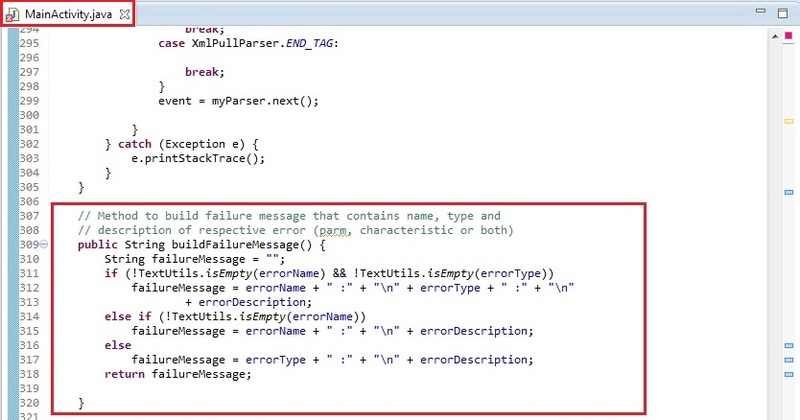 In case of CHECK_XML status, We retrieve XML response string from the result using getStatusString method. So we will call a method handleEMDKResult to handle this EMDKResults, which we will create in the next step. In this step, we will add displayResults method to display the result of profile operation. If the Profile is successfully applied, it will proceed with the respective power manager operation and in case of any errors, we will display a dialog with the corresponding error details. 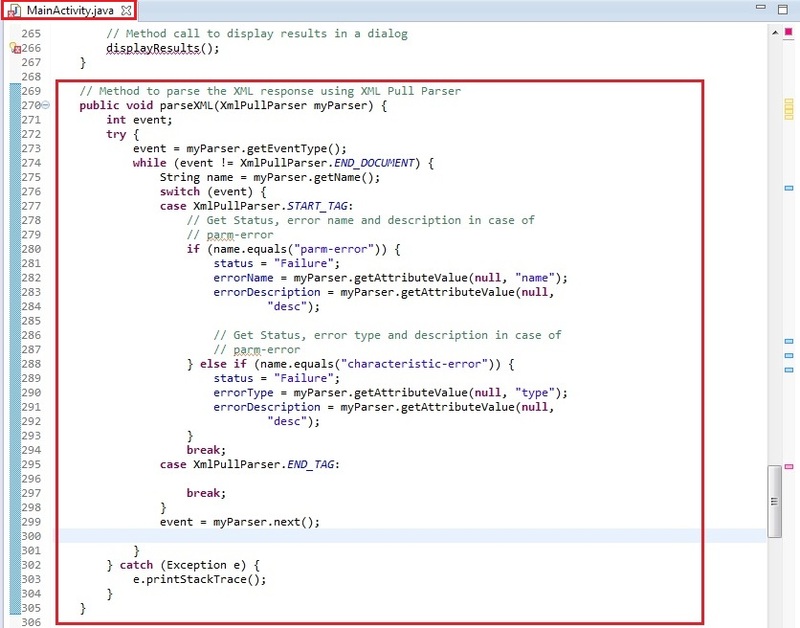 // Display dialog in case of errors else proceed. Let us set the required layout/View for this tutorial. 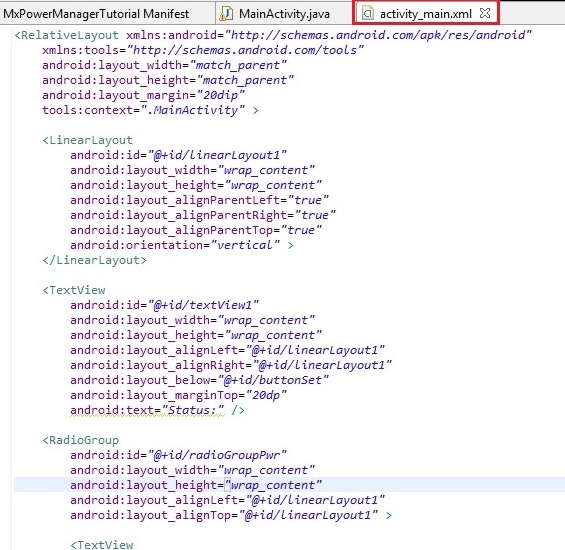 Remove all the code, inside "res/layout/activity_main.xml". Add the following code that has three radio buttons that enable user to select a specific Power Manager feature, an Edit Text that allows user to enter the external SD Card path to the OS update package (zip file), a Text View that displays the status of every operation the user performs and a Button that triggers the user selected Power Manager feature and configures the device based on that. 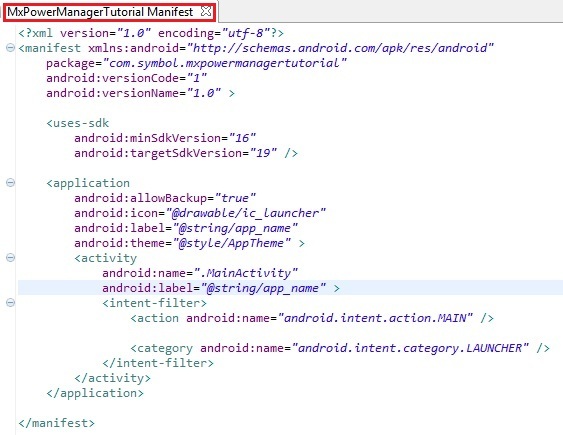 android:text="Choose your Power Manager Option:"
android:text="Specify Path and Name of the Zip file in the file system for OS Update"
android:hint="Path and Name of Zip file"
Get the reference of UI elements and make a call to 'addSetButtonListener' method in 'onCreate' method. We would add this method in the next step. 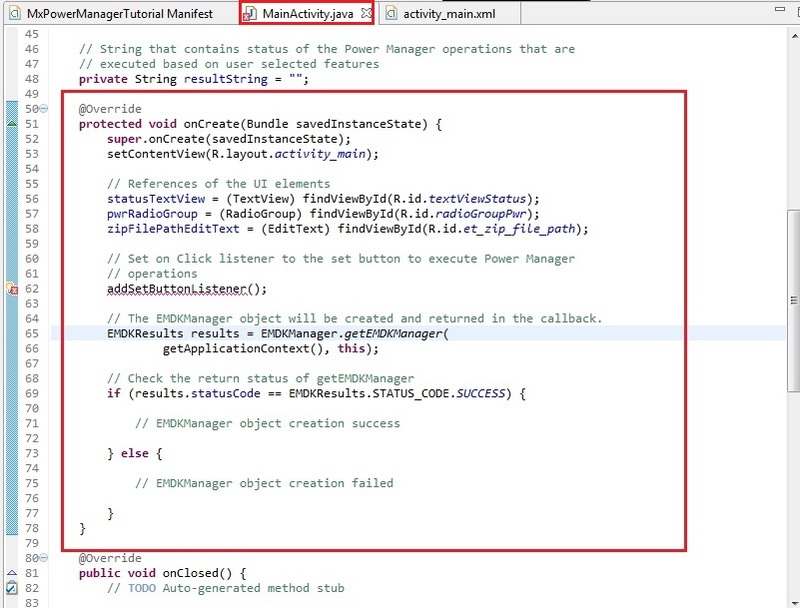 The method 'addSetButtonListener' creates on Click Listener for the Set Button that implements Power Manager settings selected by user. 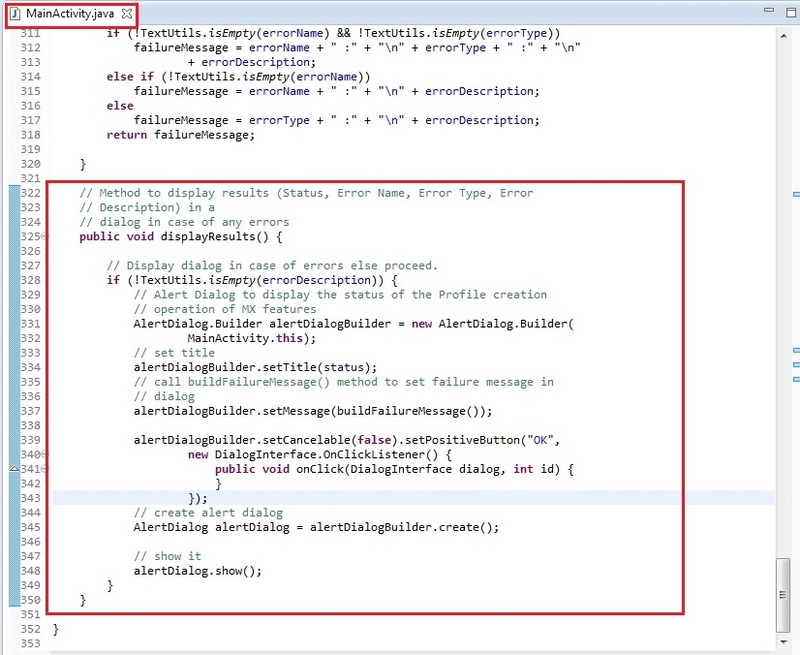 It shows an error on the method call of 'addSetButtonListener' because we have not yet added this method. We would now add the 'addSetButtonListener' method that implements on click listener of the radio buttons that are assigned to each of the Power Manager feature. As explained earlier, it sets an integer code (1-Sleep, 4-Reboot or 8-OS Update) in the variable 'value' and then calls 'modifyProfile_XMLString' method that actually modifies the Profile settings based on this value and configures the device against that Power Manager feature. 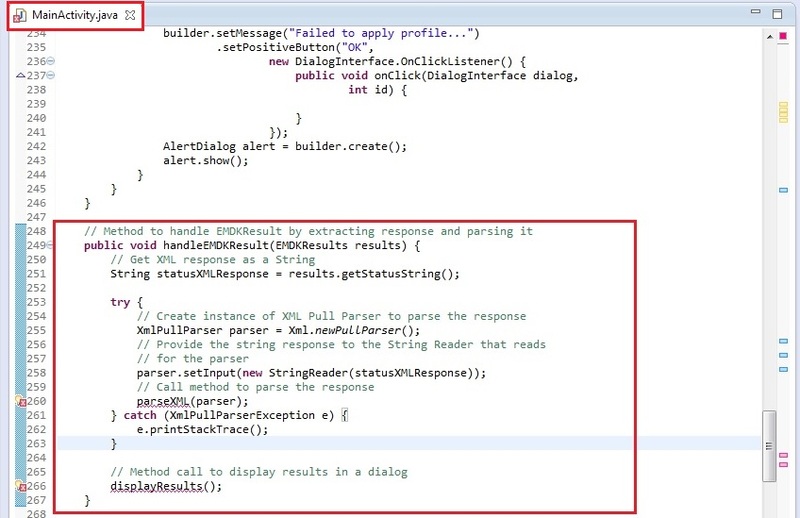 The above code would display error at the call of modifyProfile_XMLString method as we have not added that method yet. 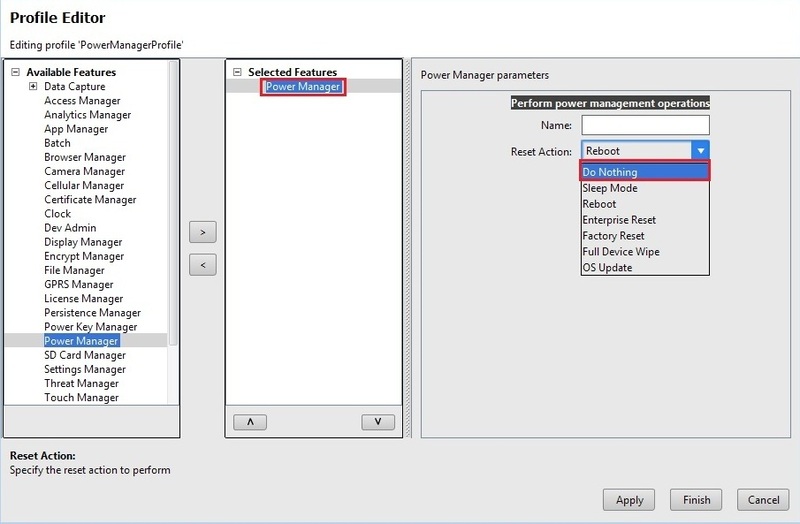 This is the method that actually modifies the Power Manager Profile Settings and configures the device with the user selected Power Manager feature (Sleep Mode, Reboot or OS Update). This method prepares the xml input for the processProfile method based on "value" attribute. If the value is 1 or 4 (Sleep Mode or Reboot), then the XML input remains the same except value attribute. 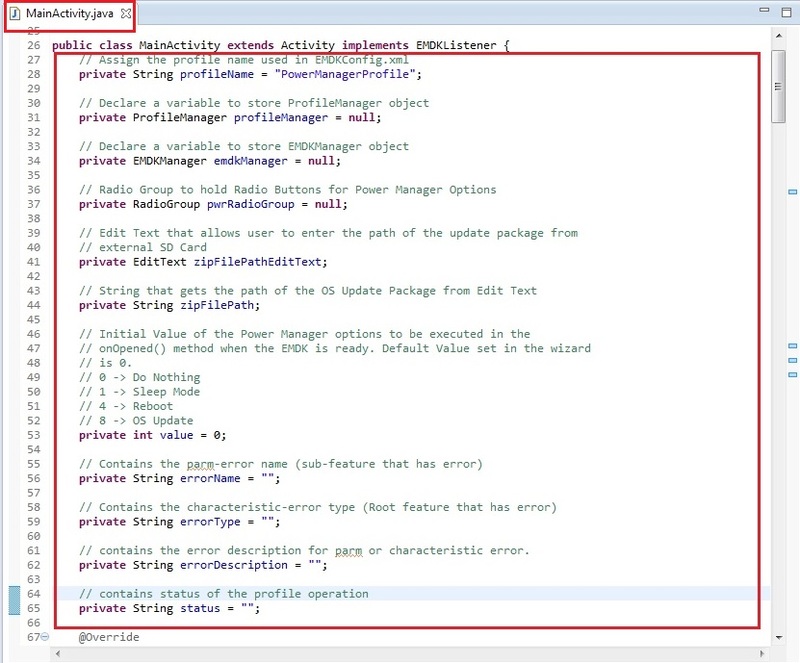 If the value is 8 (OS Update), we need to add path to the OS Update package in XML input. So the XML input for this case would be different as explained in the If-Else condition of the code. We would capture that path from the Edit Text and store it to the zipFilePath variable. It then calls handleEMDKResult method and sets the profile by following similar steps as explained in case of onOpened method. Following is an example of XML input for OS Update feature of Power Manager where the zipFilePath variable contains the path of the update package. modifyData = <?xml version=\"1.0\" encoding=\"utf-8\"?>"
+ "\"/>" + "<characteristic type=\"file-details\">"
+ "\"/>" + "</characteristic>" + "</characteristic>"
The processProfile method then sets the changes to Profile Manager and returns the result to the EMDKResults. 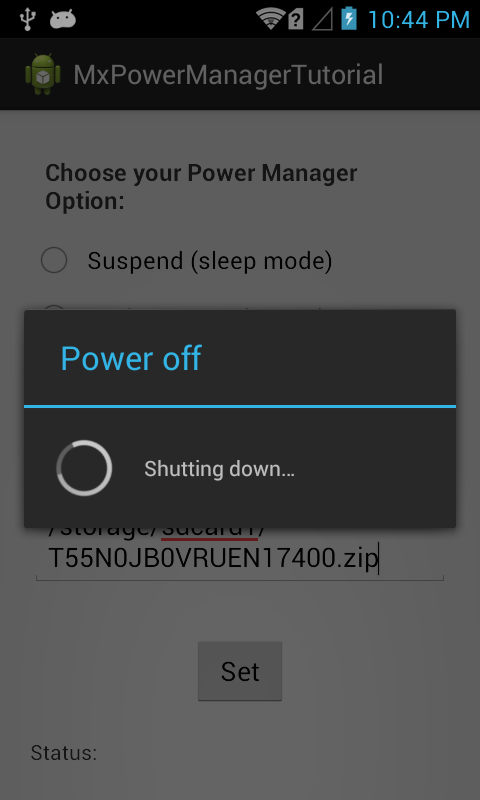 // user selected options of Power Manager feature. + "&lt;parm name=\"ResetAction\" value=\"" + value + "\"/&gt;"
+ "&lt;parm name=\"ZipFile\" value=\"" + zipFilePath + "\"/&gt;"
If the EMDK is closed abruptly, a callback method onClosed gets called, where you could release your EMDKManager. Run the application. Since we have set Do Nothing parameter in the Profile Manager wizard, the app just loads and performs no operations. So you can see the main page with three radio button options (Sleep Mode, Reboot and OS Update). Now we will select these options one by one. So select "Suspend" radio button and press the "Set" button. This will put your device into sleep mode by locking it. As you can see, the device has been locked. So unlock it and the app will be resumed. So now select second option (Reboot) and press the "Set" button. 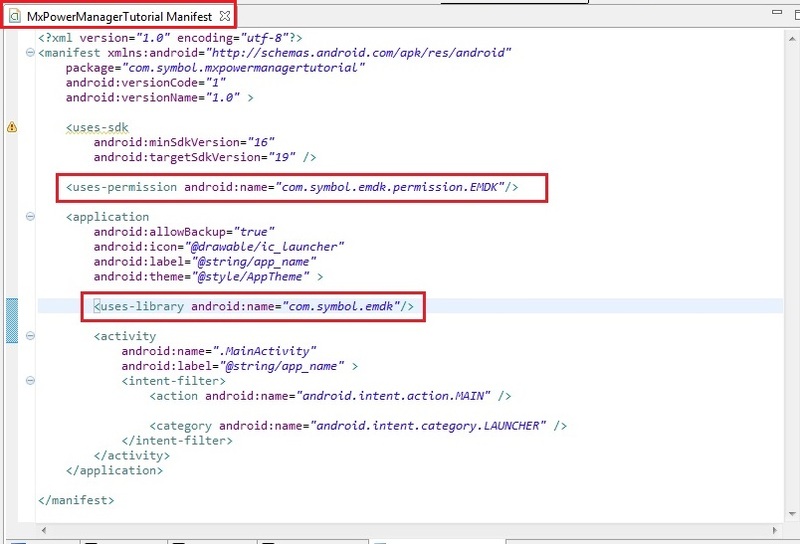 This should reboot your Symbol Android device. As the device was rebooted in the previous step, open the app again and select the third option (OS Update). Provide the path in the Edit Text to the external SD card where the OS Update Package is located. This package should be a zip file downloaded from this link (Ex. /sdcard/T55N0JB0VRUEN17400.zip). This package could be an OS upgrade, Factory Reset or Enterprise Reset package as this feature allows you to perform all these operations. We will be using an update Package that has been downloaded from above link for TC55 device. Once the "Set" button is pressed, the phone will shut down for performing OS update with the respective update package. Note: In case of failure due to incorrect path, the app will display a failure message in the status Text View at the bottom. Finally the device reboots to configure and apply the OS update changes. Now that you have learned how to configure and perform Power Management operations on your Symbol Android devices through applications using Mx Power Manager feature, let us try to understand and implement some of the other Mx features. So in the next tutorial, we will concentrate on the "Persist Manager" feature and try to explore this feature by creating a tutorial.